IMMOMIG AG and newhome.ch – The partnership of the year! As the market leader for many years, we are entering into a partnership with newhome.ch, the free real estate portal of 18 cantonal banks, in order to offer you the most powerful products and services at the most attractive prices. newhome.ch offers everything you would expect from a leading real estate marketplace. With a meaningful selection of services, you get the ideal conditions to offer your properties even more effectively. 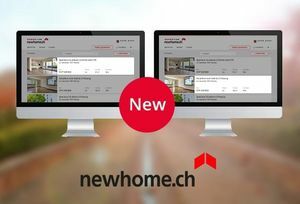 This makes newhome.ch one of the most respected real estate portals in Switzerland, both for providers and searchers. "We are very much looking forward to continuing to offer our customers a higher added value through this cooperation with newhome.ch. Indeed, newhome.ch is doing an excellent job from which all our clients will benefit remarkably" says Patrick Maillard, founder and CEO of IMMOMIG AG. Thanks to the implementation of state-of-the-art technologies you can benefit from an unbeatable offer: Immomig® LITE with 50% discount in the first year!